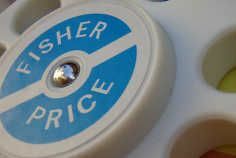 ​Best known for products aimed at younger children, the Fisher Price brand has always been associated with toys that deliver great value for the price since the early 1930’s. Fisher Price has been a well known brand in most toy stores across the United States for many years and nearly every adult today has played with Fisher Price toys at one time or another in their lives. Best known for its products aimed at infants, toddlers and preschoolers, over the years since the company was first founded in 1930, the company has created over 5,000 different toys to date. The company has always been associated with toys that deliver great value for the price and beginning in the early 30’s the firm made durable and lasting products out of heavy steel and pine, and added colorful details through the use of lithographic labels as found on "Dr. Doodle" in 1931, the first toy Fisher Price sold. Later, in the 1950’s, the company recognized that the then new material called plastic was suitable for making toys and allowed it to create durable details and brighter colors into its toys. The early 50’s toy called "Buzzy Bee" was the first Fisher-Price toy made of plastic and the company went on to create some 40 more plastic toys before the decade ended. In keeping with its products aimed at younger children, one of the best-known Fisher-Price toys series was the Little People line that included people and animal figures along with various accessories like a house, farm, school, and various vehicles. In the early days the Little People figures were made of wood and over time they evolved into molded plastic figures with detailed features. In time, Fisher Price covered many different toys and toy brands that people all over the U.S. remember fondly. Some of the most enduring products over the years have been marketed under the Fisher-Price name include Disney, Sesame Street, Barney, Dora the Explorer and See 'n Say. Some of the most popular toys and most recognizable toy brands that have remained popular over the years include Power Wheels, View-Master, Rescue Heroes, the Chatter Telephone, and the Rock-a-Stack. The company evolved along with the rest of the nation over its 80+ year history and has gained success in the modern market by branching out to infant care products and high-tech electronic toys for preschoolers. In 1969, Herman Fisher retired as President of Fisher-Price at the age of 71 and the company was acquired by The Quaker Oats Company that same year. The firm cut ties with Quaker Oats in 1991 and operated as an independent, publicly traded company until 1993 when Fisher-Price became a wholly owned subsidiary of Mattel. This merger with Mattel gave the firm new vigor in the overall toy marketplace and allowed it to grow in international markets through product acquisitions like Mattel's acquisition of Tyco Toys in 1997 that allowed Fisher-Price to become the single brand name over all of Mattel's infant and preschool toy lines. Today the Fisher Price brand still represents the highest standards of quality and innovation and its toys are sold in toy stores around the world.